I know, I know. You’re probably thinking kale was so last year…am I right? I think that’s the awesome thing about these “fad” foods…it gets people trying them! I don’t know who starts these fads, but I thank them. 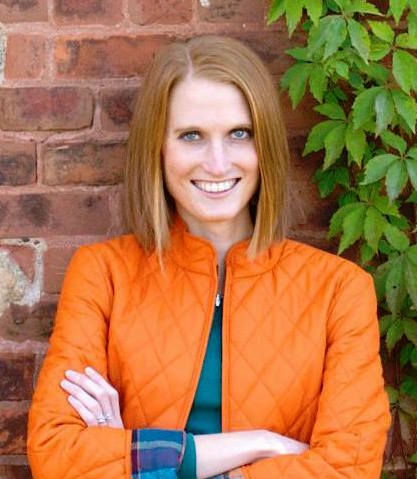 As a dietitian, I love hearing from people the new, healthy foods they’re adding to meals or trying for the first time. Plus, as more fad foods come in year after year, they keep getting put into our growing repertoire of nutritious foods to use in our cooking. The first step is just branching out and trying them. How great is it when you have the confidence to cook with kale, quinoa, or any other new food you used to be scared of? Recently a produce sales representative came to my work with unique and exotic produce and I got to listen in (and take home lots of produce!). Well, kale sprouts were definitely unique. It’s a cross between Brussels sprouts and Russian Red Kale. Rather than having the long stalks like kale we typically see in the grocery store, these look like a tiny head of kale. They’re so cute, how could you not like them?! 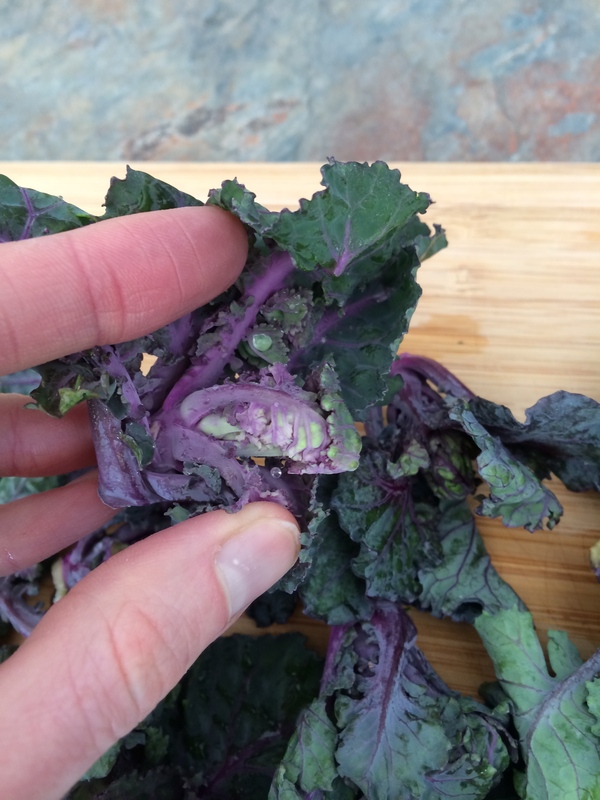 The middle of the kale has a tiny, compact head similar to a Brussels sprout. 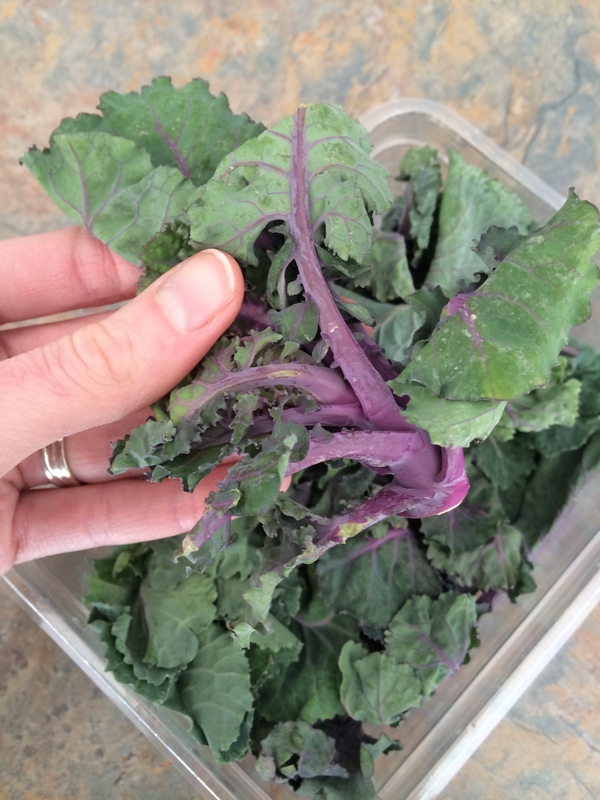 The kale is harvested just when the first leaves of the plant develop around that head. I thought the color is the most striking…and we all know I love me some color in my food. Each color in fruits or vegetables means it has different nutrients in it, which is why we need to “taste the rainbow” in our produce. Just getting our greens would leave us lacking in all the wonderful goodness that yellow, orange, and red produce have to offer. 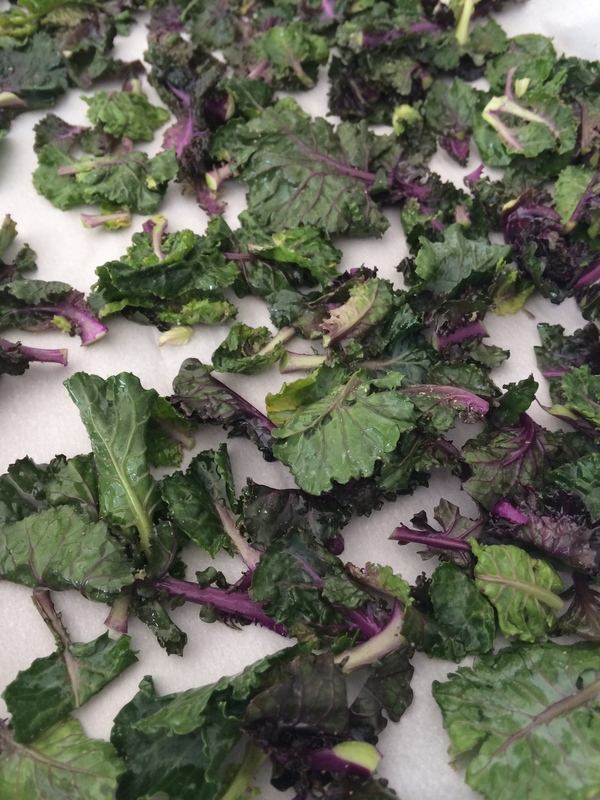 Since kale sprouts are part Red Russian Kale, it has a great silvery-green to blue-gray leaf and a crimson to purple vein rather than the solely green color in a curly kale variety. 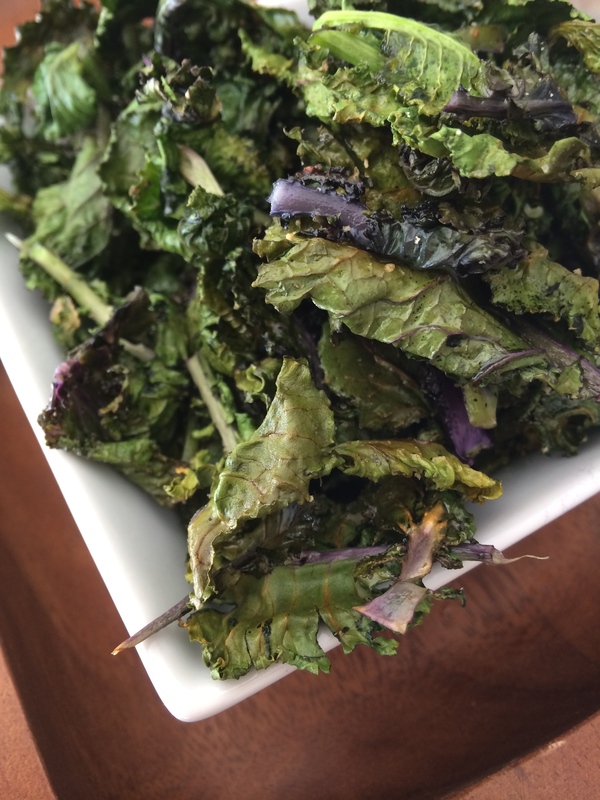 Although it looks much different than kale we typically think of, the flavor is actually quite similar with a sweet, peppery taste and worked great made into Kale Sprout Chips. 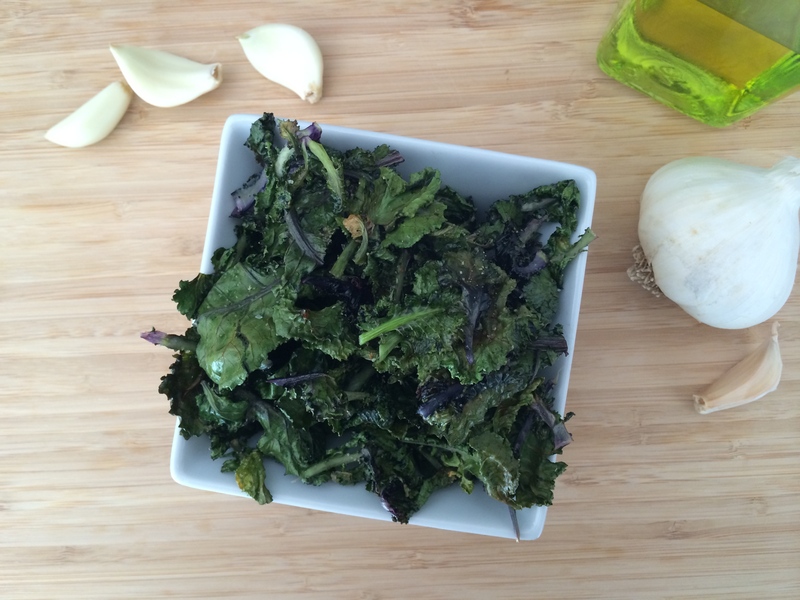 If you’ve never tried kale chips before, now is the perfect time to start! They’re light and airy yet crisp with a good crunch. No, they’re not a complete replacement to potato chips, but they can cure that need for something crunchy or that salty craving without all the calories. Plus, they take no time at all to whip up. I usually make small batches, because no matter how hard I try, they’re never really all that great the second day (no chip is good soggy). I make just enough for Philip and I to enjoy in one day afternoon (they vanish quickly!). 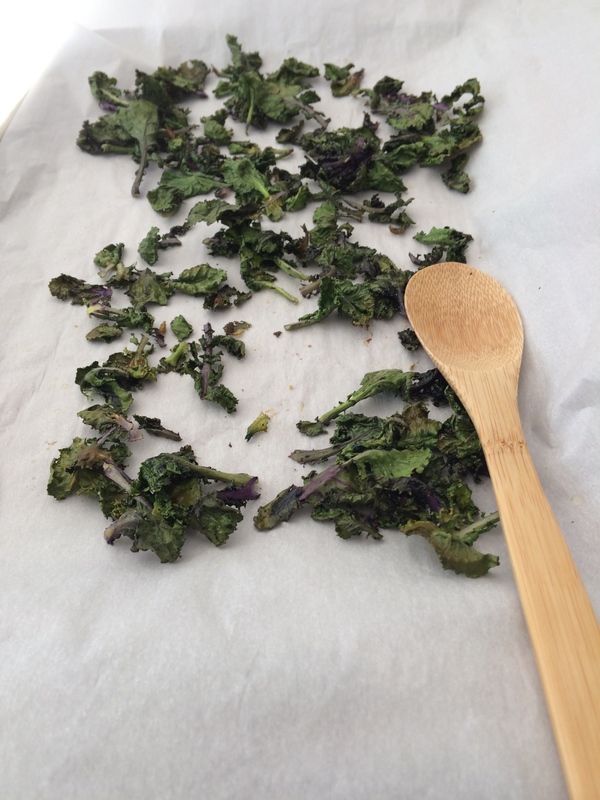 To make some kale sprout chips, I used two 3-ounce packages of fresh kale sprouts. If your grocery store carries these, they’d be in the produce section. If you can’t find them, any variety of kale would work for these chips, too. Start the process by rinsing and patting dry the kale sprouts. I felt like I wasn’t using these kale sprouts to their full potential since I next cut off the leaves from the center head and discarded the head. I think next time I’d try just keeping the head on and see how they work. I loved how all the leaves were the just the right size for kale chips after removing the head rather than having to chop them up like a typical kale leaf. Place the leaves in a single layer on a parchment lined baking sheet. Drizzle a little bit of olive oil over the kale and toss to completely cover. It doesn’t take much! Since Philip loves garlic, I chose to add garlic flavor to these chips by sprinkling on garlic powder with a little bit of salt and pepper. I like the added flavor, too; it really takes the chips up a notch with the punch of flavor. After sprinkling on the seasonings, toss the kale leaves a little bit more before putting them in the oven for 18–20 minutes until nicely crisped. I usually check the chips every 10 minutes or so to make sure they’re not burning and to stir them around a little bit. After taking them out of the oven, as soon as you can eat them without burning your tongue, they’re ready to eat! Simple, nutrient-packed, and a perfect afternoon snack. 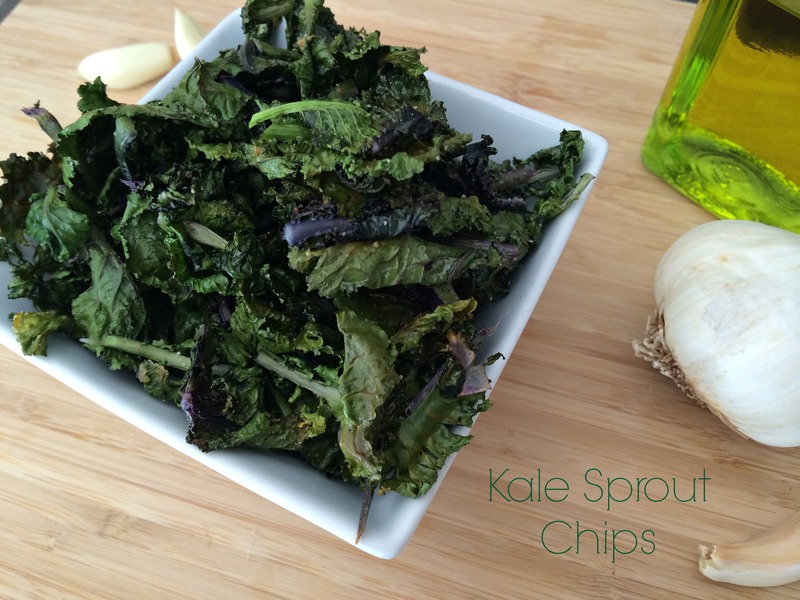 Give this one a try and add kale sprouts to your repertoire of health foods! What other foods have you tried recently that are new to you? 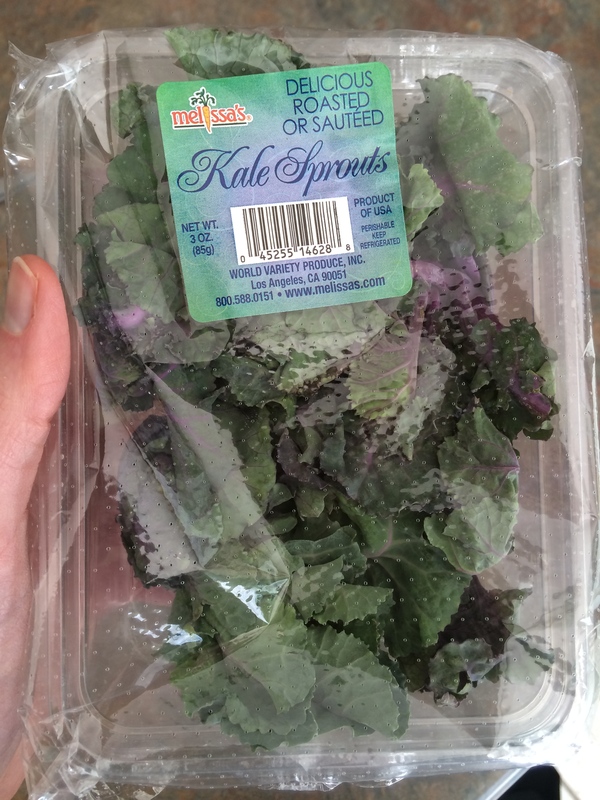 Have you tried kale sprouts before? Rinse and pat dry kale sprouts. 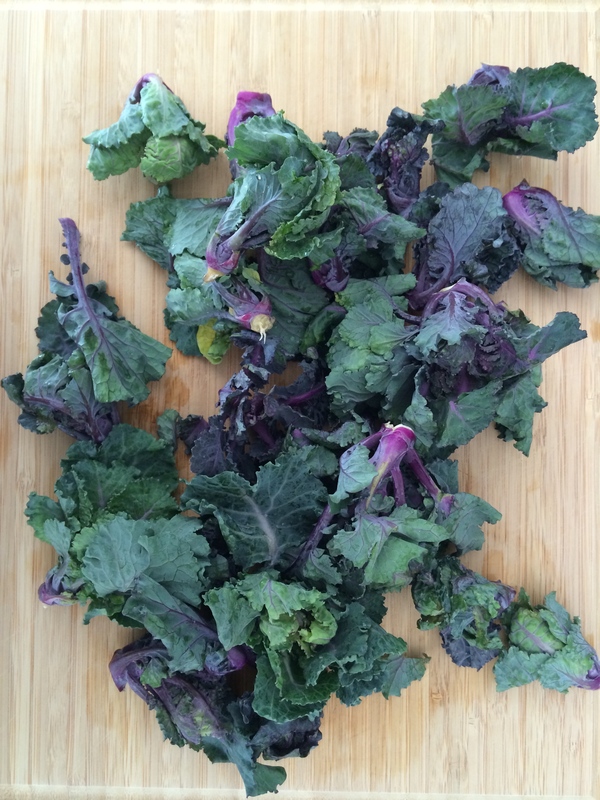 Cut the leaves of the kale sprouts from the head; discard heads. 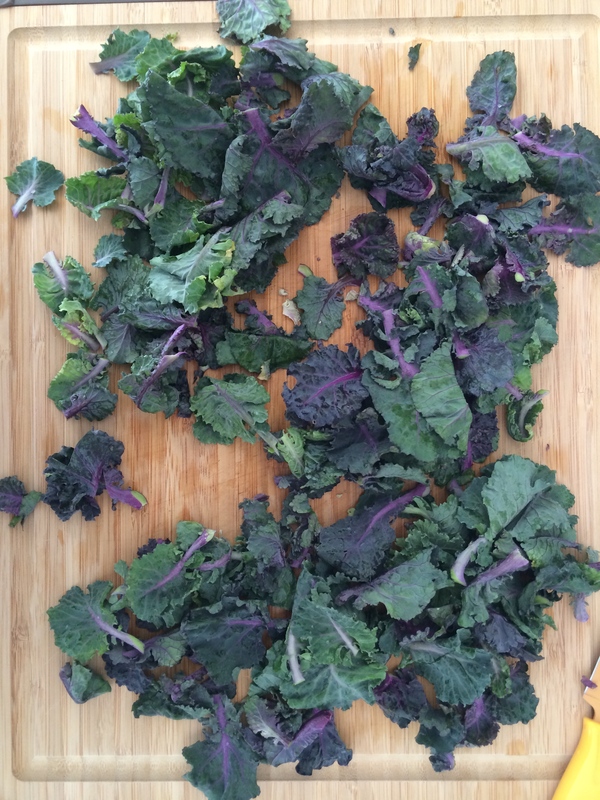 Place kale leaves in a single layer on a parchment-lined baking sheet. Drizzle olive oil over the kale and toss to thoroughly coat. Sprinkle garlic powder, salt, and pepper on the leaves and toss to mix. 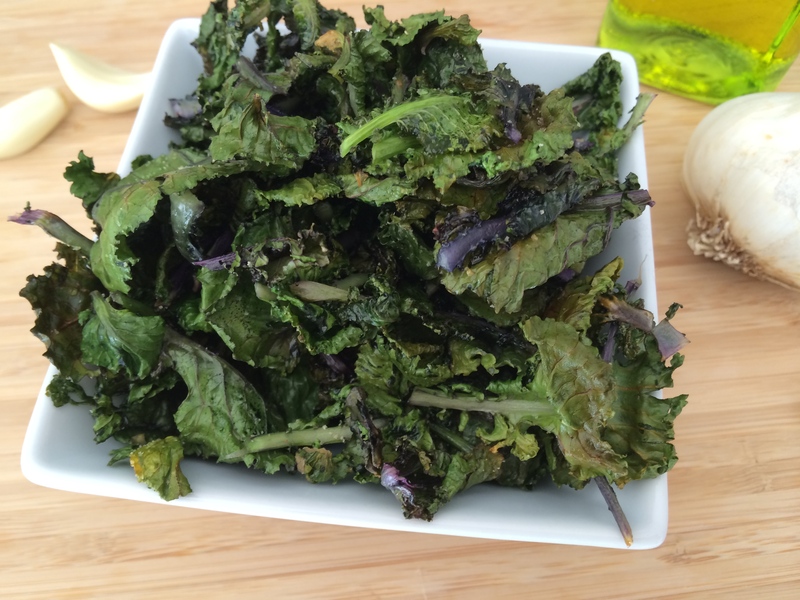 Bake in preheated oven for 18–20 minutes, stirring the kale chips every 10 minutes. Bake until chips are crisp and lightly browned. Posted in Snacks on March 3, 2014 by Kara Hoerr.